Director – John Erick Dowdle, Screenplay – Drew Dowdle & John Erick Dowdle, Producers – Patrick Aiello, Drew Dowdle, Jon Jashni & Thomas Tull, Photography – Leo Hinstin, Visual Effects Supervisor – Jamie Dixon, Visual Effects – Hammerhead Productions, Special Effects Supervisor – Philippe Hubin, Makeup Effects – Olivier Alfonso, Guillaume Castagne & Pascal Larue, Production Design – Louise Marzaroli. Production Company – Legendary Pictures/Brothers Dowdle. Scarlett Marlowe is a professor of urban archaeologist who is obsessed with finding the legendary Philosopher’s Stone. In Paris, she and her interpreter George trace a trail of obscure inscriptions left by the legendary alchemist Nicolas Flamal that lead to the catacombs beneath the streets. She persuades a team of locals who know the tunnels to lead an expedition down there. However, as they venture down a dangerous pathway, following the clues and dealing with the traps that have been set, it becomes apparent that the trail is leading them to the gateway to Hell. I have had my eyes on the Dowdle Brothers – John Erick who directs, his brother Drew who produces and both who co-write the script – for the last few years. They first gained genre attention with their third film, the exceptional Found Footage serial killer film The Poughkeepsie Tapes (2007). This had them invited to make Quarantine (2008), the English-language remake of [Rec] (2007), a further Found Footage film. They subsequently went on to make The Night Chronicles 1: Devil (2010), a non-Found Footage film about The Devil masquerading as one of a group of people trapped in an elevator. As Above So Below was followed by the non-genre action film No Escape (2015) and they created/produced/directed the tv mini-series Waco (2018). The Brothers Dowdle demonstrate a preference for genre material and have so far turned out above-average films. Moreover, they are the only creative team consistently working within the Found Footage genre – The Poughkeepsie Tapes did amazing thing before the genre went astronomical, while Quarantine was perfectly competent. 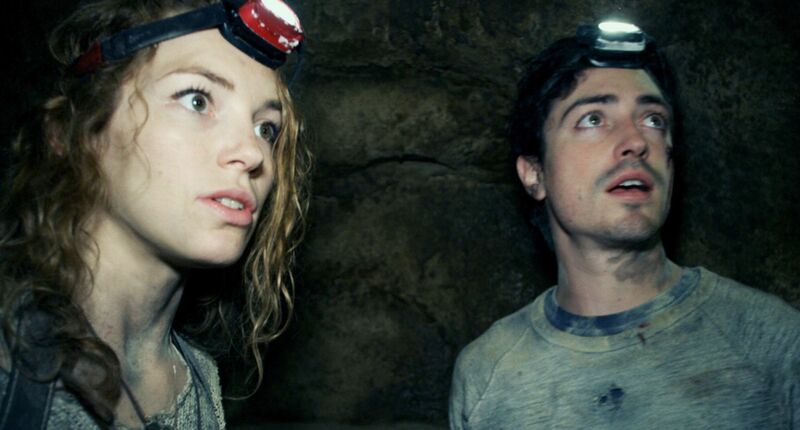 With their third venture into the form in As Above So Below, the expectation is that they are going to do something that bursts open and does amazing things with a genre that has become tediously over-mined in the last few years. Unfortunately, As Above So Below falls way below any of these expectation. 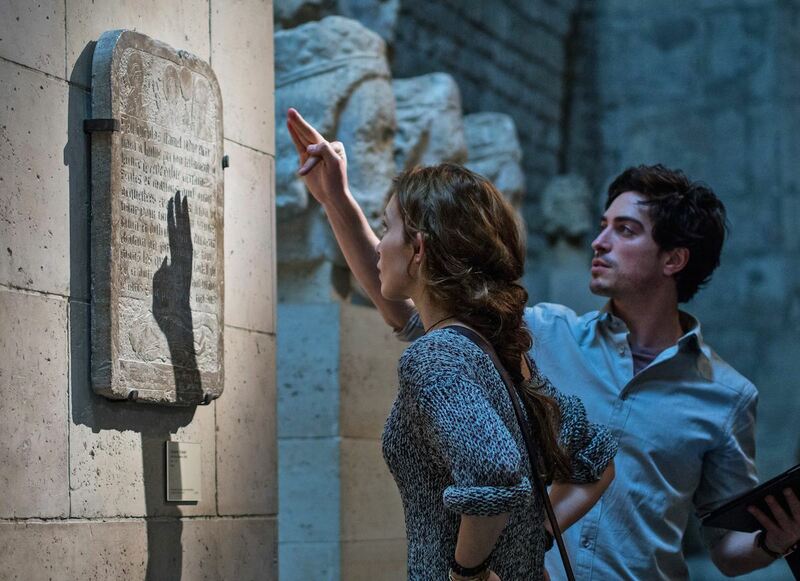 A substantial part of the film seems like sub-The Da Vinci Code (2006) with Perdita Weeks following a trail of cryptic clues around various archaeological locations in Paris. These seem uninterestingly handled – what seems lacking is any of this part is the fascinated excitement you get in a good detective puzzle, even a not very good film like The Da Vinci Code, where clues and hints suddenly fall into place and become clear. Often the babble of historical namedrops and intuitive leaps that Perdita Weeks operates by seems like the tenuous logic that only makes sense to conspiracy buffs. 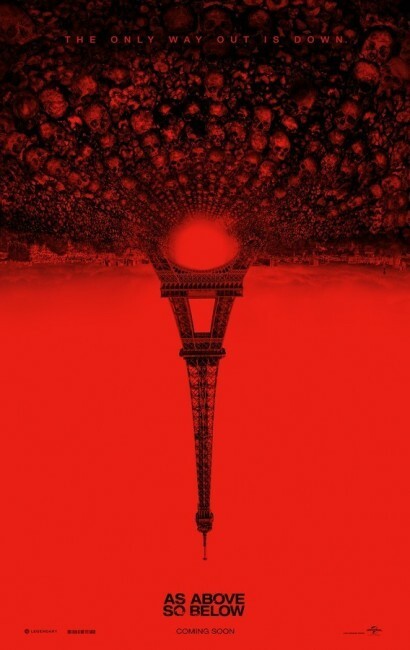 More than anything, As Above So Below gives the impression that it was conceived around its location where the Brothers Dowdle gained permission – indeed, tax credit from the French authorities – to be able to shoot in the real-life catacombs under the streets of Paris. These look undeniably impressive and interesting. However, take the location away from the film and all that you would be left with is half-baked deviltry nonsense. The script’s mutterings about alchemy, the Philosopher’s Stone and clues leading to the gateway of Hell never makes it clear what is happening, where they are going or even entirely where they have ended up. Who, for instance, is the mysterious girl who appears at the nightclub and later among the worshippers glimpsed inside one of the caves – we never know because she and they are not mentioned again. The film seems a random series of pop-up scenes with wraiths, spirits, devil worshippers, elements from each of the party’s individual pasts and a few Tomb Raider-type traps and cryptic mysteries that is more akin to a haunted house attraction than anything that has been construed with any rationale. In their other films, the Brothers Dowdle have done a fine job in spooking and scaring us. There is the scene here where Edwin Hodge becomes trapped in a tiny access hole filled with bones that makes one immediately start to think that what we are in for is a Found footage version of The Descent (2005). The Descent was an excellent film that generated incredible tension out of the claustrophobia of underground spaces and one’s hope is that the Brothers Dowdle, despite a dull lead-in, might do the same. Only they never do. The Dowdles create one or two promisingly uncanny moments – the discovery of a piano underground and then Ben Feldman finding that it is missing the very same key that the one from his childhood did; where they hear a telephone ringing and Perdita Weeks answers it to hear someone talking to her by name; where the party are crawling through a narrow defile and find souls looking up from beneath begging for help. The best scene is one where they encounter the surreal image of a burning car in one of the rooms, where this triggers memories from Francois Civil’s childhood, he is snatched inside as the car vanishes, leaving only a pair of legs protruding from out of the rock. Other than these occasional moments, As Above So Below is a disappointment.